P.T. Barnum was a 19th Century American showman and circus promoter, best known for founding the first modern three-ring circus, which eventually became the largest and most important circus in the world, the Ringling Brothers Barnum and Bailey Circus. Barnum purchased Scudder's American Museum in New York in 1841, and built it into one of the most successful operations in the US. 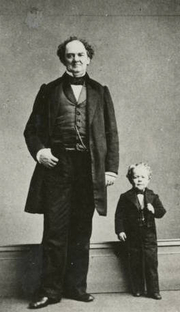 Famous people he introduced to the American public included Charles Strattan, the famous midget known as “General Tom Thumb”; soprano Jenny Lind, the "Swedish Nightingale”; and Chang and Eng Bunker, the original "Siamese" (conjoined) twins. P. T. Barnum is currently considered a "single author." If one or more works are by a distinct, homonymous authors, go ahead and split the author. P. T. Barnum is composed of 6 names. You can examine and separate out names.